P and I spent a wonderful Christmas morning with my family in Jupiter and then headed up to Tallahassee to see his family in the afternoon. It was a wild ride up the Florida Turnpike and I-75! We saw plenty of cows in fields. Did you know Florida is the largest cattle producing state east of the Mississippi River? Yep, lots mooing going on here. We also saw the lowest gas prices of the season just outside of Inverness. You better believe we stopped to fill up the tank. $1.93??? Pinch me, I’m dreaming. On our five and a half hour drive, I became obsessed with a roadside attraction / tourist trap called the Florida Citrus Center. I think P was more excited about Waffle House than the citrus. At first, I though there was only one. Then, after seeing a Florida Citrus Center at each exit for the next 50 miles, I started to get the hint. My favorite part was the signs advertising live baby gators. A remarkable thing I’ve noticed while driving north through central Florida throughout the years is the abrupt change of foliage. One minute, you’re driving through a toll booth flanked by royal palms, the next you’re surrounded by gargantuan live oaks draped in moss. 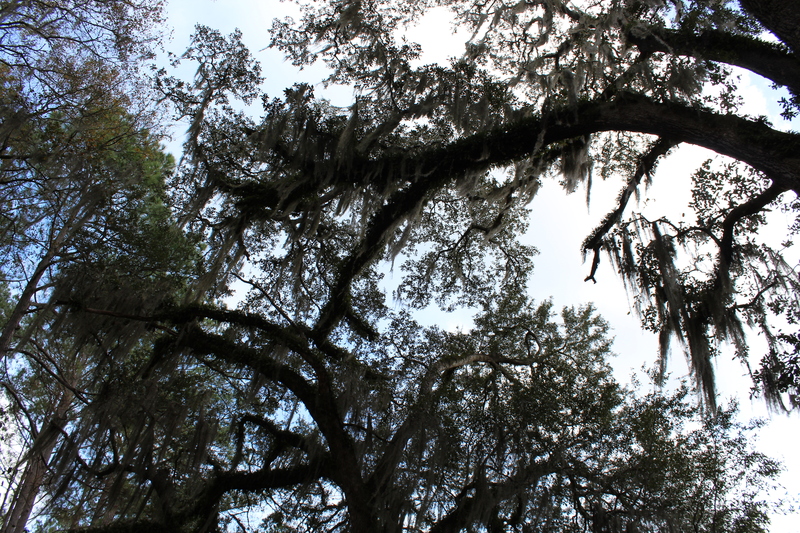 Moss draped Oaks in Tallahassee. The trees in Tallahassee are particularly beautiful. I tried to get pictures of the many trees arching over the highways, creating leafy tunnels, but I’m not quite used to motion photography yet. Instead, you’ll have to settle for some snapshots from the small park near P’s mother’s home, which is full of magnificent oaks. P and I loved this big branch growing out toward the pond. It was good for both swinging and sitting. Temperatures were in the low-80’s, which is extremely warm for Tallahassee this time of year. I could still wear my shorts, which made this JUP Girl very happy. We spent most of the weekend outside with P’s beloved childhood chocolate lab, Winston. Even though we’ve been back in Jupiter for a couple of weeks now, I’m still reminiscing about our long walks down the oak-lined streets. Here’s to more oak-lined evening walks in the near future!